I started keeping marine fish almost 50 years ago, just about the time that marine fish started to show up in a few pet stores. It was also about the time that Robert Straughan introduced the concert of the “undergravel filter.” It was also the time when John Miklosz and I started the publication called the Marine Aquarist. In those day just trying to keep marine fish alive in captivity was a challenge. The important lesson then was how to create a biologically active filtration system. After some painful trial and error we learned how to establish nitrifying bacteria in a filter bed, which were able to convert ammonia into relatively harmless nitrogen salts. Eventually, the undergravel filter was replaced by the far more efficient “trickle filter.” These biological filters prevented fish from poisoning themselves with toxic ammonia, but this development uncovered an even more pernicious problem: marine fish parasitized by protozoans – especially Cryptocaryon irritans, Amyloodinium ocellatum, and Brooklynella hostilis. 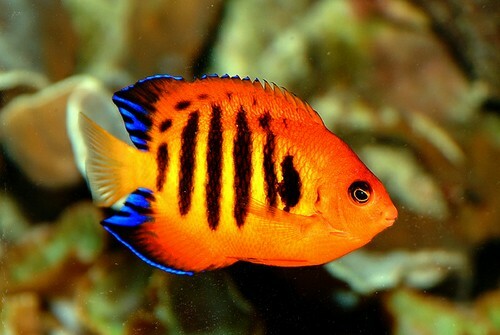 An angelfish (Centropyge loriculus) particularly effected by low levels of copper. In those days copper, in various compounds, was the medication of choice. The use of copper then was effective against said protozoans, but only if it could be kept at an effective concentration. This was easier said than done as the active copper ion readily precipitated, usually forming copper carbonate, which was ineffective. It was therefore best to treat a parasitized fish in a empty glass tank. This, of course, did not eliminate protozoans from the display tank, and once the stressed fish was returned it was readily parasitized again. I often wrote in those days regarding copper treatment that it was hard to know what level of copper would kill the parasites and not the host, that is, the fish. Something, I suppose, like chemotherapy usage against cancer in humans. I suspect that more fish died from the copper treatment than from the parasites. Advanced Aquarist is therefore very pleased to publish in this issue a thoroughly researched study about copper toxicity entitled Effects of copper exposure on marine ornamental fish reproduction and survival, by Chatham Callan, Ph.D. Research Scientist, Oceanic Institute.